How much does it cost to travel to Luxor? How much money will you need in Luxor? E£358 ($21) is the average daily price for traveling in Luxor. The average price of food for one day is E£91 ($5.28). The average price of a hotel for a couple is E£355 ($21). Additional pricing is in the table below. These average travel prices have been collected from other travelers to help you plan your own travel budget. How much money do I need for Luxor? Egypt is surely on the top of every history lover's bucket list. Nowhere is the history more engrossing than in Luxor. From amazing monuments dating back to ancient Thebes to rows of temples up the Nile, this remarkable city is full the stories of past greatness. The East Bank  or the central part of Luxor Township  is the hotbed for tourism. This is where most of the hotels and resorts are, while the West Bank is home to the ancient ruins and archaeological wonders you'll want to explore. Before traveling to Egypt, be sure to check on the current affairs and political climate. It could have a major effect on the amount of tourists visiting, and, if conditions are too dangerous, you may want to reschedule. Also note, ladies, to avoid any issues, dress modestly. This is a very conservative region of the world. The less skin showing, the better. It's time to unleash your inner Indiana Jones in this land of archaeological astonishment. There is so much to see in this region of the world, but you'll want to start at the Valley of the Kings. This Theban Necropolis is an expansive area of tombs of pharaohs past. Take a guided tour through any means of transportation  taxis, boats, bikes, even donkeys will carry through here. On average, eleven tombs are open to the public on any given day. The biggest draw of this area is, of course, the tomb of King Tutankhamen. When you first walk in you'll see the mummy of the boy king laid next one of his three sarcophagi. This marvelous structure held young King Tut for 3,000 years. It's a bit dark in this tomb, so for a good view of everything be sure to bring a torch. This tomb is truly spectacular, so you may want to save it for last. There are several others to visit including the tomb of the only female pharaoh  Hatshepsut. After you've successfully wandered the Valley of the Kings, you may need to take a break. 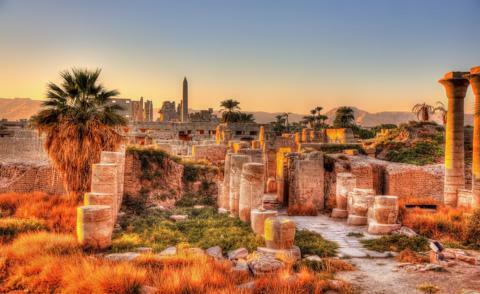 Once you've recuperated, you'll want to check out Karnak Temple. Built 1,300 years ago, this massive area is like visiting the land of giants. Amazing columns covered in hieroglyphics tower over visitors as they stroll around the temple. It's an awe-inspiring way to spend the afternoon. The Luxor Temple is a bit more concise and coherent since there were only four different pharaohs involved in its building. The biggest draw here is a stroll along the Avenue of Sphinxes. And if you simply haven't had your fill of history yet, pay a visit to the Luxor Museum. Here you'll see the gilded head of Hathor  the goddess of motherhood  and the funeral bed of King Tut. For the perfect nightcap, take a walk along the Nile to watch the sunset. Just north of the Mummification Museum on the East Bank is a tranquil trail perfect for relaxing after a long day of historical exploration. Hugging close to the east bank of the Nile, the main area of Luxor does not extend very far to the east. Situated mostly north-south, navigation is easy as long as you keep your eye on the river. Karnak and it's sprawling temple complex lies to the north (down river) of central Luxor, also on the east side of the NIle. The Luxor Temple makes a great central landmark, just as it did in ancient times. Surrounded by hotels, restaurants, and a central market, the Luxor Temple can act as your setting off point for everything you might need in town. On the west side of the Nile, set back in the desert, lies the Valley of the Kings, Valley of the Queens, Hatshepsut Temple, and other ruins. Other than touring the main historical ruins and archaeological areas, Luxor offers a number of unique cultural activities. With its position on the Nile, boat trips in traditional felucca sailboats are available for just an hour or two, or several days if you're up for more adventure. Camel rides are also a great option. Various locals run camel operations in the area, and rides can last a few hours and pass along scenic views of the river or near some of the ruins in the desert. Horseback riding and donkey rides are another option. Hot air balloon rides are also a great way to take in the desert, the Nile, and the views of the ruins from a new vantage point. Check out Magic Horizon Balloons for more info and a great experience. With so many tourists, most tastes will be accommodated in the restaurants along the Nile. To get a taste of the local culture, the dishes you'll certainly not want to miss, are the falafels, fava beans and fuul. There's also tabbouleh salad, fattoush with shrimp and shish taouk. Travelling between banks is simple with so many options. You can always take a taxi or a bus over the bridge, but the quickest way to get across is by ferry. When traveling around the towns in Luxor, the quickest mode is the Kabout. These pick up taxis or microbuses have fixed routes and stop whenever they are flagged down. With all the taxis in the area, you'll still need to play hardball with the drivers. Haggle for a lower price or risk being taken for a fool. For a more luxurious way to get around town, hire a felucca for the day. These sailboats are available all along the rive, but just like with the cab drivers, be ready to bargain. If the weather is right, bicycling around Luxor can be quite a unique experience. Be extra cautious when riding at night, however. Most drivers don't use their headlights after the sun goes down.